Voyager & Endeavor: Reading and Writing for Today’s Adults stands alone in the way it engages and empowers students. Voyager provides a solid foundation of balanced instruction to ensure success and keeps students involved in every lesson. Voyager provides teacher support throughout and meets accountability standards. The best-selling nine-level program combines a contemporary theme-based approach with the best elements from traditional direct instruction. 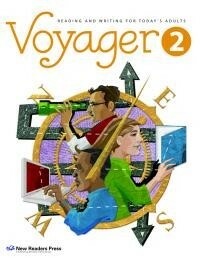 Voyager & Endeavor: Reading and Writing for Today’s Adults stands alone in the way it engages and empowers students. Students understand what they will be learning in each lesson and why, with Learning Goals presented at the beginning of every lesson. Pre-reading segments in every lesson allow students to share their experience and knowledge and relate them to the upcoming reading selection. Students apply active learning strategies in each reading and writing activity. Think About It and Write About It pages contain activities that continually reinforce the active learning strategies and develop specific skills. Voyager & Endeavor: Reading and Writing for Today’s Adults provides a solid foundation of balanced instruction to ensure success. The series balances direct and indirect instruction in skills, strategies, and processes. It balances meaning emphasis and skills emphasis. It balances the type of readings that are part of each lesson, from literature and poetry to documents and informational selections. Voyager & Endeavor are highly appealing and they keep students' involved in every lesson. Student books 1-8 are each divided into four units. Every unit has its own theme, such as Everyday Heroes, Family Ties, A Sense of Community, and Success on the Job. Integrated reading, writing, speaking, and listening activities in each lesson focus on the theme of the unit. Short stories, student writing, contemporary literature, biographies, informational selections, and documents (charts, graphs, etc.) provide variety and relevance. Multicultural readings appeal to a wide audience and cross age barriers. Readings present characters who are good family members, citizens, and workers. Each page is inviting, non-intimidating, and adult-looking to keep your students reading. Voyager & Endeavor provides teacher support throughout and meets accountability standards. Lesson-by-lesson teacher’s notes, extension activities, and photocopy masters provide a complete road map for teaching critical reading and writing skills. Flexibility allows for individual as well as group instruction. The series is compatible with standardized tests such as informal/portfolio assessments. It reflects and integrates elements from balanced instruction, SCANS, and EFF (Equipped for the Future). Free TABE, CASAS, and SCANS correlations are available upon request.